Here are some simple models, designed for kids and teens who would like to try their hand at seed bead jewelry and discover a new seed bead activity. Two crimp beads and a clasp. The double structure of this necklace is emphasized by the long, silvered tubes that break with the classic rounded form typical of necklaces. We will use two nylon threads which will be brought together halfway up the necklace. Begin with the lower part of the necklace, placing each tube and seed bead in symmetrical fashion. Stop with two large beads which will form the join. Now make the upper, shorter part : the same tubes are used but the diameter of each bead separating the tubes is now smaller. Join the two necklaces at the large beads and continue the necklace on both sides using the double thread.Even when doubled, the nylon thread allows for easy threading of beads and tubes. For the fastener : thread a crimp bead (little silver or gold metallic bead, depending on your clasp color) after the other beads. Thread the nylon through the clasp ring (already closed or to be closed using a clip), then pass it back through the crimp bead and a few of the other beads. Flatten the crimp bead with the clip and cut the protruding wire. This avoids having to tie a knot, never very elegant when done with nylon thread. 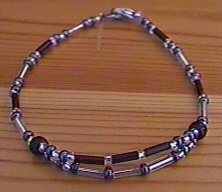 This bracelet is made in the same way, using seed beads and tubes. Another variation on the nylon thread and seed bead necklace theme: here we create a looped necklace. In this model, the loop is decorated with three 'fan' beads which create depth and add originality. Start by threading the beads, always keeping the design symmetrical, for the "loop" part of the necklace. Form the loop. For kids, it's easier to tie a knot to fix the loop. This knot is then hidden with Two large beads. Repeat the same sequence of beads after the loop tie as that used just before it - this creates a double symmetry. Keep threading the seed beads then finish the necklace as described earlier.